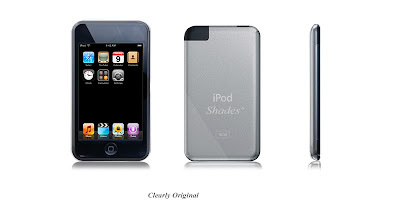 Shades iPod touch case is a Polyurethane soft plastic layer that encloses the entire iPod touch, except for its headphone port, and Dock Connector. The Sleep/Wake button covered, but the Shade exposes its full bottom save for its corners. “It’s Not a Case. It’s Not a Skin. It’s Shades for iPod Touch” is the slogan of this product. And there a reason behind the slogan: it is only 0.4mm thick.. so it is thinner than any iPod touch case that you’ll ever find. To be more accurate, it is not exactly a case, but are half way between cases and film. The Polyurethane material is 100% durable, providing your iPod touch with full protection, including crystal-clear screen protection, while providing full access to all of the iPod's ports, allowing you to plug in just about anything. It will keep your iPod touch safe from keys and other surfaces that might scratch the back. In addition, it is smooth but isn’t particularly slippery so it won’t fall out of your fingers. There are 12 Stylish Vibrant Colors available for the Shade cases. You may view them here. The price for this product is currently USD 16.95.